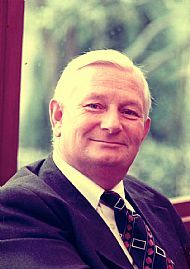 To read the wonderfully warm obituary of Professor Flinn which appeared in The Economic History Review Vol. 37, No. 1 (Feb., 1984), pp. v-vii, please click here. Last published in 1962 by the Edinburgh University Press, copies of Men of Iron are hard to find, even in local libraries. 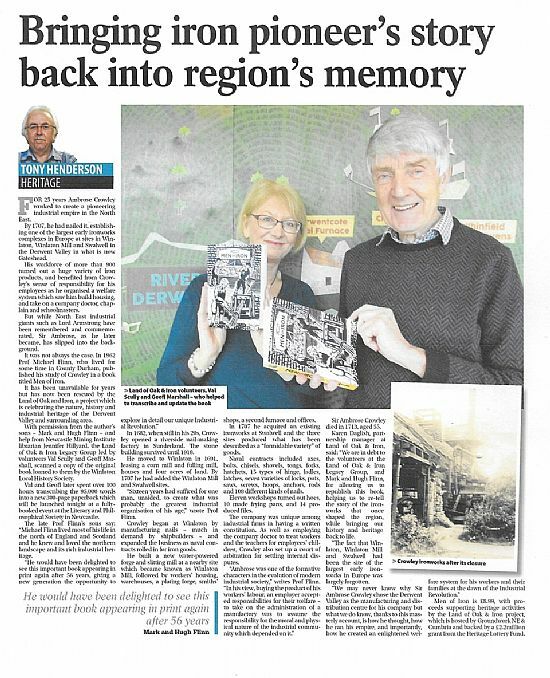 The Land of Oak & Iron project has awoken a tremendous interest in the unique industrial heritage of the Derwent Valley, so I decided to try to get the book back into print. With the help of Professor Christopher Smout (pictured right), I traced the author's elder son, Mark Flinn, who is the retired Pro Vice-Chancellor of Edge Hill University. 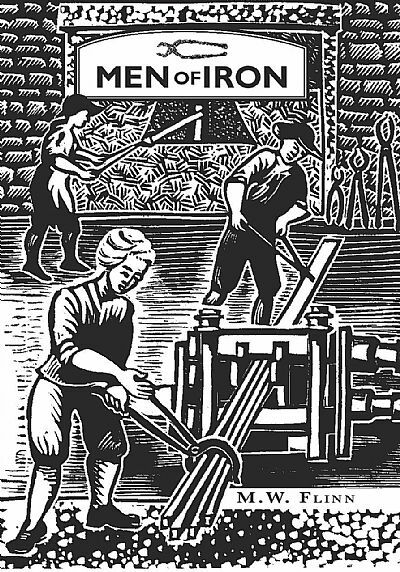 After discussions with his family, Mr Flinn signed a document giving the Land of Oak & Iron permission to publish a new edition of his father's book. 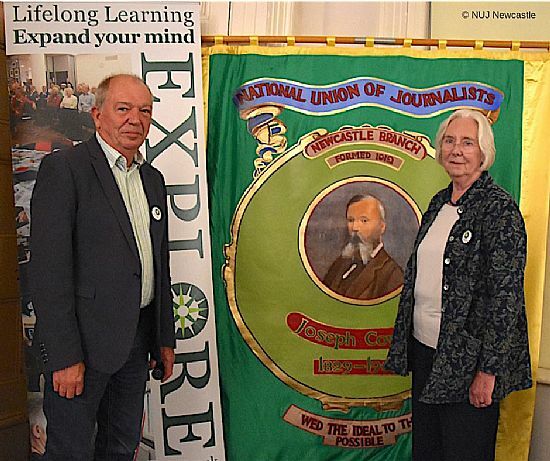 Dr William Lancaster, who delivered the inaugural Joseph Cowen Lecture which was presented by Explore Lifelong Learning at Newcastle's Literary and Philosophical Society on 19th September 2018, explains the book's significance. Click here to read a contemporary Review of Men of Iron. With the invaluable help of librarian Jennifer Hillyard, I arranged to scan the book at the North of England Institute of Mining and Mechanical Engineering. Jen set me going on the overhead A2 scanner, carefully lifting the glass panel and pressing down as hard as I dared on the rare hardback copy, which belongs to Blaydon Library. After about 90 minutes, all 270 pages had been scanned and stored as individual Tiffs. Jennifer then went quickly through the images of the pages, expertly editing before pressing the button to create a PDF file. 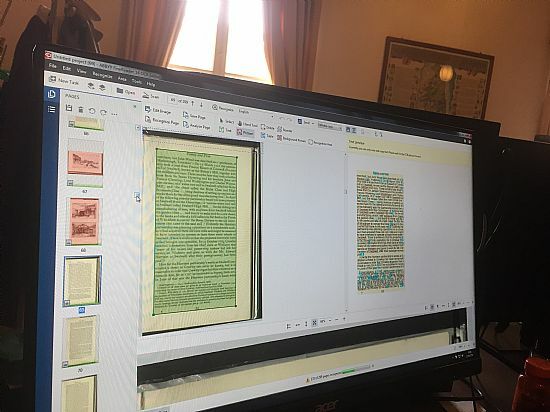 The vital next step was to use ABBYY Finereader software to convert the PDF into a Word document. Images had to be preserved, and some text - like this family tree - saved as images. After almost four hours we had a workable Word document: what I hadn't been prepared for was quite how much work it was going to need! 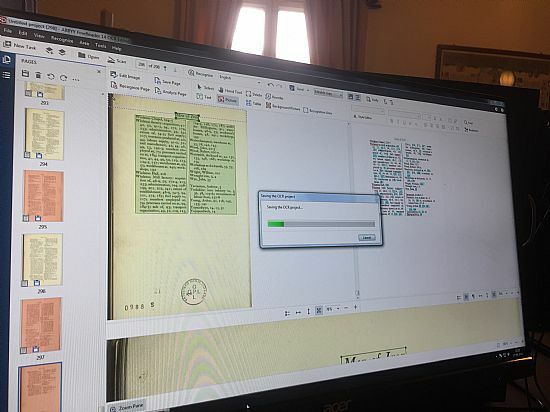 Although the optical character recognition (OCR) scanner is a marvellous invention and I'd have been lost without it, it had had fun in the translation, throwing in odd words in block capitals or italics, failing to recognise the £ symbol, playing fast and loose with its interpretation of words. 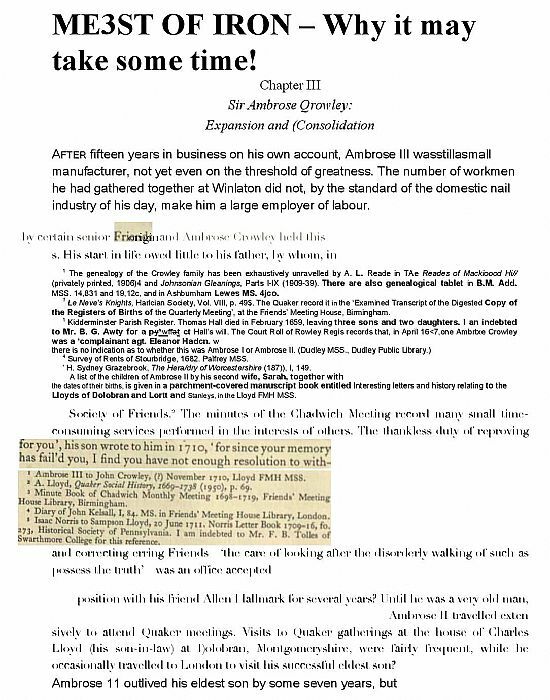 About 90% of the pages have footnotes, some of them taking up almost half the page, but the tiny font has been misread and the footnote numbers themselves often appear as asterisks in the main body of the text. Of the 95,000 words in the whole document, misreadings are appearing at a rate of about one word in ten: a common occurrence is the letter e appearing as c. Capital H often appears as It. It all needs to be done with a fine tooth-comb and is going to take several months to finish! Click here to see a larger version of the entertaining selection of randomly-chosen samples seen below. Because the book's index is so comprehensive and complex, above all I wanted to avoid having to alter it in any way, so it was imperative that all the original page numbers were kept the same. (Eg: All the text you can see in the image below needed to be on one page). I had to begin by trying different font sizes, margins, spacing and so on to make each page of text take up the same amount of space as the original. 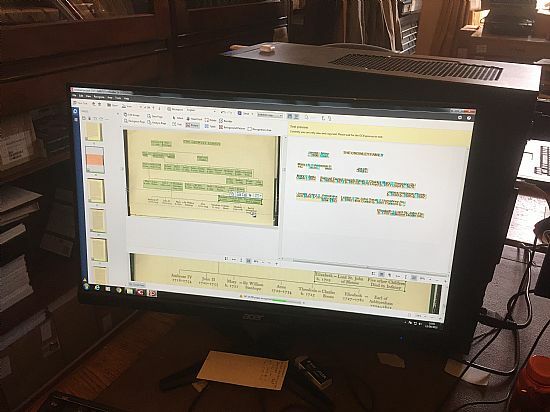 I had hoped I'd be able to re-format the existing document but that proved impossible because of the unpredictable page-breaks and wilful page-numbering! 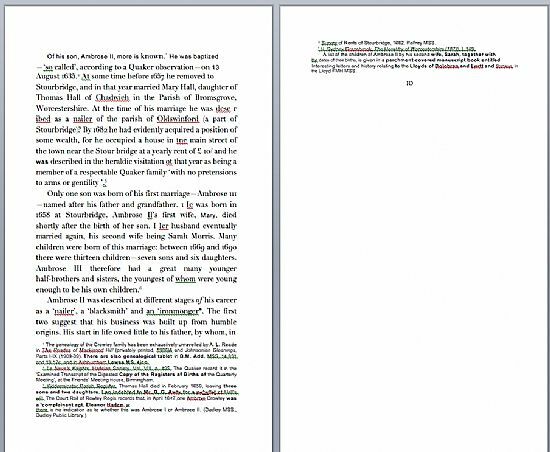 I had to create a fresh document and am importing by copying and pasting each page's text separately. 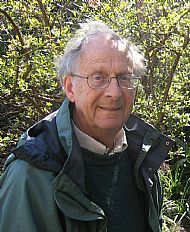 But then fellow volunteer Geoff Marshall offered to do the page-setting using his InDesign software!